For other uses, see Pretoria (disambiguation). Clockwise from top left: Pretoria CBD skyline, Voortrekker Monument, Church Square, the Palace of Justice, Loftus Versfeld Stadium, Administration Building of the University of Pretoria and Front view of the Union Buildings. 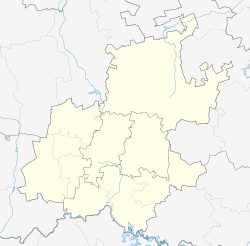 Pretoria (/prɪˈtɔːriə/; Xhosa: E-Pitoli) is a city in the northern part of Gauteng province in South Africa. It straddles the Apies River and has spread eastwards into the foothills of the Magaliesberg mountains. It is one of the country's three capital cities, serving as the seat of the administrative branch of government (Cape Town is the legislative capital and Bloemfontein the judicial capital), and of foreign embassies to South Africa. Pretoria has a reputation for being an academic city with three universities, the Council for Scientific and Industrial Research (CSIR) and the Human Sciences Research Council. The city also hosts the National Research Foundation and the South African Bureau of Standards making the city a hub for research. Pretoria is the central part of the Tshwane Metropolitan Municipality which was formed by the amalgamation of several former local authorities including Centurion and Soshanguve. There have been proposals to change the name of Pretoria itself to Tshwane, and the proposed name change has caused some public controversy. Pretoria is named after the Voortrekker leader Andries Pretorius, and within South Africa sometimes called the "Jacaranda City" due to the thousands of jacaranda trees planted in its streets, parks and gardens. Pretoria was founded in 1855 by Marthinus Pretorius, a leader of the Voortrekkers, who named it after his father Andries Pretorius and chose a spot on the banks of the "Apies rivier" (Afrikaans for "Monkeys river") to be the new capital of the South African Republic (ZAR). The elder Pretorius had become a national hero of the Voortrekkers after his victory over Dingane and the Zulus in the Battle of Blood River. The elder Pretorius also negotiated the Sand River Convention (1852), in which the UK acknowledged the independence of the Transvaal. It became the capital of the South African Republic (ZAR) on 1 May 1860. The founding of Pretoria as the capital of the South African Republic can be seen as marking the end of the Boers' settlement movements of the Great Trek. During the First Boer War, the city was besieged by Republican forces in December 1880 and March 1881. The peace treaty which ended the war was signed in Pretoria on 3 August 1881 at the Pretoria Convention. The Second Boer War resulted in the end of the Transvaal Republic and start of British hegemony in South Africa. The city surrendered to British forces under Frederick Roberts on 5 June 1900 and the conflict was ended in Pretoria with the signing of the Peace of Vereeniging on 31 May 1902 at Melrose House. The Pretoria Forts were built for the defence of the city just prior to the Second Boer War. Though some of these forts are today in ruins, a number of them have been preserved as national monuments. The Boer Republics of the ZAR and the Orange River Colony were united with the Cape Colony and Natal Colony in 1910 to become the Union of South Africa. Pretoria then became the administrative capital of the whole of South Africa, with Cape Town the legislative capital and Bloemfontein served as the judicial capital. Between 1910 and 1994, the city was also the capital of the province of Transvaal. (As the capital of the ZAR, Pretoria had superseded Potchefstroom in that role.) On 14 October 1931, Pretoria achieved official city status. When South Africa became a republic in 1961, Pretoria remained its administrative capital. Pretoria is situated approximately 55 km (34 mi) north-northeast of Johannesburg in the northeast of South Africa, in a transitional belt between the plateau of the Highveld to the south and the lower-lying Bushveld to the north. It lies at an altitude of about 1,339 m (4,393 ft) above sea level, in a warm, sheltered, fertile valley, surrounded by the hills of the Magaliesberg range. Pretoria has a humid subtropical climate (Köppen: Cwa) with long hot rainy summers and short cool to cold, dry winters. The city experiences the typical winters of South Africa with cold, clear nights and mild to moderately warm days. Although the average lows during winter are mild, it can get cold due to the clear skies, with nighttime low temperatures in recent years in the range of 2 to −5 °C (36 to 23 °F). The average annual temperature is 18.7 °C (65.7 °F). This is rather high, considering the city's relatively high altitude of about 1,339 metres (4,393 feet), and is due mainly to its sheltered valley position, which acts as a heat trap and cuts it off from cool southerly and south-easterly air masses for much of the year. Rain is chiefly concentrated in the summer months, with drought conditions prevailing over the winter months, when frosts may be sharp. Snowfall is an extremely rare event; snowflakes were spotted in 1959, 1968 and 2012 in the city, but the city has never experienced an accumulation in its history. During a nationwide heatwave in November 2011, Pretoria experienced temperatures that reached 39 °C (102 °F), unusual for that time of the year. Similar record-breaking extreme heat events also occurred in January 2013, when Pretoria experienced temperatures exceeding 37 °C (99 °F) on several days. The year 2014 was one of the wettest on record for the city. A total of 914 mm (36 in) fell up to the end of December, with 220 mm (9 in) recorded in this month alone. In 2015 Pretoria saw its worst drought since 1982; the month of November 2015 saw new records broken for high temperatures, with 43 °C (109 °F) recorded on 11 November after three weeks of temperatures between 35 °C (95 °F) and 43 °C (109 °F). January 2016 saw Pretoria reach a new record high of 44 °C (111 °F) on 7 January 2016. Depending on the extent of the area understood to constitute "Pretoria", the population ranges from 700,000 to 2.95 million. The main languages spoken in Pretoria are Sepedi, Sesotho, Setswana, Xitsonga, Afrikaans and English. The city of Pretoria has the largest white population in Sub-Saharan Africa. Since its founding it has been a major Afrikaner population centre, and currently there are roughly 1 million Afrikaners living in or around the city. Even since the end of Apartheid, Pretoria itself has had a white majority, albeit with an ever-increasing black middle-class. However, in the townships of Soshanguve and Atteridgeville black people make up close to all of the population. The largest white ethnic group are the Afrikaners and the largest black ethnic group are the Northern Sothos. The lower estimate for the population of Pretoria includes largely former white-designated areas, and there is therefore a white majority. However, including the geographically separate townships increases Pretoria's population beyond a million and makes whites a minority. Pretoria's Indians were ordered to move from Pretoria to Laudium on 6 June 1958. Pretoria is known as the "Jacaranda City" due to the approximately 50 000 Jacarandas that line its streets. Purple is a colour often associated with the city and is often included on local council logos and services such as the A Re Yeng rapid bus system and the logo of the local Jacaranda FM radio station. Pretoria has over the years had very diverse cultural influences and this is reflected in the architectural styles that can be found in the city. It ranges from 19th century Dutch, German and British Colonial Architecture to modern, postmodern, neomodern, and art deco architecture styles with a good mix of a uniquely South African style. Some of the notable structures in Pretoria include the late 19th century Palace of Justice, the early 20th century Union Buildings, the post-war Voortrekker Monument, the diverse buildings dotting the main campuses of both the University of Pretoria and the University of South Africa, traditional Cape Dutch style Mahlamba Ndlopfu (the President's House), the more modern Reserve Bank of South Africa (Office skyscraper) and the Telkom Lukas Rand Transmission Tower. Other well-known structures and buildings include the Loftus Versfeld Stadium, The South African State Theatre and the Oliver Tambo building which is the Headquarters of the Department of International Relations and Cooperation (which is a good example of neomodern architecture in South Africa).The Lukasrand Tower is located on Muckleneuk Hill in the Lukasrand suburb on the outskitrts of the central city and is a prominent landmark in the skyline. The at the foothills of the Union Building on the corner of Stanza Bopape and Pine in Arcadia you have the spectacular Church of Scientology Building which is a Heritage site. The buildings are over 100 years old and was home to the builders and constructors of the Union Building itself. Despite the many corporate offices, small businesses, shops and government departments that are situated in Pretoria's sprawling suburbs, its Central Business District still retains its status as the traditional centre of government and commerce. Many banks, businesses, large corporations, shops, shopping centres and other businesses are situated in the city centre which is towered by several large skyscrapers, the tallest of which is the Poyntons Building (110 m (360 ft) tall), the ABSA Building (132 m (433 ft) tall) and the Reserve Bank of South Africa building (150 m (490 ft) tall). The area contains a large amount of historical buildings, monuments and museums that include the Pretoria City Hall, Pretorius Square, Church Square (Along with its many historical buildings and statues) and the Ou Raadsaal. There is also the Transvaal Museum (the country's leading natural history museum, which although it has changed venues a number of times, has been around since 1892), the National Zoological Gardens of South Africa (or more colloquially known as the Pretoria Zoo), Melrose House Museum in Jacob Maré Street, the Pretoria Art Museum and the African Window Cultural History Museum. Several National Departments also have Head Offices in the Central Business district such as the Department of Health, Basic Education, Transport, Higher Education and Training, Sport and Recreation, Justice and Constitutional Development, Public Service and Administration, Water and Environmental Affairs and the National Treasury. The district also has a high number of residential buildings which house people who primarily work in the district. Pretoria is home to the National Zoological Gardens of South Africa as well as the Pretoria National Botanical Garden. There are also a number of smaller parks and gardens located throughout the city, including the Austin Roberts Bird Sanctuary, Pretorius Square gardens, the Pretoria Rosarium, Church Square, Pretoria Showgrounds, Springbok Park, Freedom Park, and Burgers Park, the oldest park in the city and now a national monument. In the suburbs there are also several parks that are notable: Rietondale Park, "Die Proefplaas" in the Queenswood suburb, Magnolia Dell Park, Nelson Mandela Park and Mandela Park Peace Garden and Belgrave Square Park. Commuter rail services around Pretoria are operated by Metrorail. The routes, originating from the city centre, extend south to Germiston and Johannesburg, west to Atteridgeville, northwest to Ga-Rankuwa, north to Soshanguve and east to Mamelodi. The Gautrain high-speed railway line runs from the eastern suburb of Hatfield to Pretoria Station and then southwards to Centurion, Midrand, Marlboro, Sandton, OR Tambo International Airport, Rosebank and Johannesburg. Pretoria Station is a departure point for the Blue Train luxury train. Rovos Rail, a luxury mainline train safari service operates from the colonial-style railway station at Capital Park. The South African Friends of the Rail have recently moved their vintage train trip operations from the Capital Park station to the Hercules station. Various bus companies exist in Pretoria, of which Putco is one of the oldest and most recognised. Tshwane(Pretoria) municipality provides for the rest of the bus transport and to view the time table please visit them at Tshwane Bus Booklet. The N1 is the major freeway that runs through Pretoria. It enters the city from the south as the Ben Schoeman Highway. At the Brakfontein Interchange with the N14 it continues as The N1 Eastern Bypass bisects the large expanse of the eastern suburbs, routing traffic from Johannesburg to Polokwane and the north of the country. The R101 is the original N1, and served the same function before the construction of the highway. It runs through the centre of town rather than the eastern suburbs. The N4 enters the town as a highway from Witbank in the east, merging with the N1 at the Proefplaas Interchange. It begins again north of the city, branching west from the N1 as the Platinum Highway, forming the Northern Bypass, and heading to Rustenburg. The N4 runs east–west through South Africa, connecting Maputo to Gaborone. Before the Platinum Highway was built, the N4 continued passed the Proefplaas Interchange to the city centre, where it became a regular road, before again becoming a highway west of the city. These roads are now designated the M2 and M4. There is a third, original east–west road: the R104, previously named Church Street. Church Street has been renamed Helen Joseph from Nelson Mandela Church Square, WF Nkomo from Nelson Mandela to R511, Stanza Bopape from Nelson Mandela to the East and Elias Motswaledi from R511 to the West. The N14 starts in the centre of town from the M4 (former N4). It is a normal road heading south through the centre before becoming the Ben Schoeman highway. At the Brakfontein interchange, the Ben Schoeman highway becomes the N1, but the N14 continues as the intersecting west-south-western highway towards Krugersdorp. The R114 parallels the N14 in its westward journey running just to the north of the highway. The R21 provides a second north–south highway, further east. It starts from the Fountains Interchange south of the city centre, but is still a road until Monument Park, when it becomes a true highway. It crosses the N1 east of the Brakfontein Interchange at the Flying Saucer Interchange and runs north–south towards Ekurhuleni (specifically Kempton Park and Boksburg). Importantly it links Pretoria with the OR Tambo International Airport in Kempton Park. A proposed third north–south highway, in the west of the city, the R80 is partially built. At present the highway begins in Soshanguve. It terminates just north of the city centre at an intersection with the M1. Plans have been in place for some time to extend this all the way past the M4 and N14 highways to the N1 in Randburg. Pretoria is also served by many regional roads. The R55 starts at an interchange with the R80, and runs north–south west of the city to Sandton. The R50 starts from the N1 just after the Flying Saucer Interchange in the south-east of the city, and continues south-east towards Delmas. The R511 runs north–south from Randburg towards Brits and barely by-passes Pretoria to the west. The R514 starts from the M1, north of the city centre, and terminates at the R511. The R513 crosses Pretoria's northern suburbs from east to west. It links Pretoria to Cullinan and Bronkhorstspruit in the east and Hartbeespoort in the west. The R566 takes origin in Pretoria's northern suburbs, and exits the town to the west just north of the R513. It connects Pretoria to Brits. Finally the R573 starts from the R513, just east of the town and heads north-east to Siyabuswa. Pretoria is also served internally by metropolitan routes. For scheduled air services, Pretoria is served by Johannesburg's airports: OR Tambo International, 45 kilometres (28 mi) south of central Pretoria; and Lanseria, 35 kilometres (22 mi) south-west of the city. Wonderboom Airport in the suburb of Wonderboom in the north of Pretoria primarily services light commercial and private aircraft. However, as from August 2015, scheduled flights from Wonderboom Airport to Cape Town International Airport were made available by SA Airlink. There are two military air bases to the south of the city, Swartkop and Waterkloof. Since Pretoria forms part the Tshwane Metropolitan Municipality, most radio, television and paper media is the same as the rest of the metro area. Impact Radio, is a Christian Community Radio Station based in Pretoria, and broadcasting on 103FM in the Greater Tshwane Area. Jacaranda FM, previously known as Jacaranda 94.2, is a commercial South African radio station, broadcasting in English and Afrikaans, with a footprint that covers Gauteng, Limpopo, Mpumalanga and the North West Province and boasts a listening audience of 2 million people a week, and a digital community of more than 1,1 million people a month. The station's format is mainstream adult contemporary with programming constructed around a playlist of hit music from the 80's, 90's and now. Tuks FM is the radio station of the University of Pretoria and one of South Africa's community broadcasters. It was one of the first community broadcasters in South Africa to be given an FM licence. It is known for contemporary music and is operated by UP's student base. Radio Pretoria is a community-based radio station in Pretoria, South Africa, whose programmes are aimed at Afrikaners. It broadcasts 24 hours a day in stereo on 104.2 FM in the greater Pretoria area. Various other transmitters (with their own frequencies) in South Africa broadcast the station's content further afield, while the station is also available on Sentech's digital satellite platform. Radio Kuber Kontrei is a community-based Internet (streaming) radio station in Pretoria, South Africa, whose programmes are aimed at Afrikaans-speaking Christians worldwide. Pretoria is serviced by eTV, SABC and MNET. Pretoria News is a daily newspaper established in Pretoria in 1898. It publishes a daily edition from Monday to Friday and a Weekend edition on Saturday and Sunday. It is an independent newspaper in the English language that serves the city and its direct environs. It is available online via the Independent online website. Beeld is an Afrikaans-language daily newspaper that was launched on 16 September 1974. Beeld is distributed in four provinces of South Africa: Gauteng, Mpumalanga, Limpopo, North West. Die Beeld (English: The Image) was an Afrikaans-language Sunday newspaper in the late 1960s. Wrapped is an alternative lifestyle magazine from Africa that caters for the entire LGBT community and is not gender-dominated. Pretoria Sotho (called Sepitori by its speakers) is the urban lingua franca of Pretoria and the Tshwane metropolitan area in South Africa. It is a combination of Tswana and Northern Sotho (Pedi), with influences from Tsotsitaal and other black South African languages. It is a creole language that developed in the city during the years of Apartheid. A number of popular South African bands and musicians are originally from Pretoria. These include Desmond and the Tutus, Bittereinder, The Black Cat Bones, Seether, popular mostwako rapper JR, Joshua na die Reën and DJ Mujava who was raised in the town of Attridgeville. The song "Marching to Pretoria" refers to this city. Pretoria was the capital of the South African Republic (a.k.a. Republic of the Transvaal; 1852-1881 and 1884-1902) the principal battleground for the First and Second Boer War, the latter which brought both the Transvaal and the Orange Free State republic under British rule. "Marching to Pretoria" was one of the songs that British soldiers sang as they marched from the Cape Colony, under British Rule since 1814, to the capital of the Southern African Republic (or in Dutch, Zuid-Afrikaansche Republiek). As the song's refrain puts it: "We are marching to Pretoria, Pretoria, Pretoria/We are marching to Pretoria, Pretoria, Hurrah." The opening line of John Lennon's Beatles' song I Am the Walrus, "I am he as you are he as you are me and we are all together," is often believed to be based on the lyric "I'm with you and you're with me and so we are all together" in "Marching to Pretoria." Lennon denied this, insisting his lyrics came from "nothing." Pretoria is home to an extensive portfolio of public art. A diverse and evolving city, Pretoria boasts a vibrant art scene and a variety of works that range from sculptures to murals to pieces by internationally and locally renowned artists. The Pretoria Art Museum is home to a vast collection of local artworks. After a bequest of 17th century Dutch artworks by Lady Michaelis in 1932 the art collection of Pretoria City Council expanded quickly to include South African works by Henk Pierneef, Pieter Wenning, Frans Oerder, Anton van Wouw and Irma Stern. And according to the museum: "As South African museums in Cape Town and Johannesburg already had good collections of 17th, 18th and 19th century European art, it was decided to focus on compiling a representative collection of South African art" making it somewhat unusual compared to its contemporaries. Pretoria houses several performing arts venues including: the South African State Theatre which houses the arts of Opera, musicals, plays and comedic performances. A 9 metre tall statue of former president Nelson Mandela was unveiled in front of the Union Buildings on 16 December 2013. Since Nelson Mandela's inauguration as South Africa's first majority elected president the Union Buildings have come to represent the new 'Rainbow Nation'. Public art in Pretoria has flourished since the 2010 FIFA World Cup with many areas receiving new public artworks. One of the most popular sports in Pretoria is rugby union. Loftus Versfeld is home to the Blue Bulls, who compete in the domestic Currie Cup, and also to the Bulls in the international Super Rugby competition. The Bulls Super Rugby team, which is operated by the Blue Bulls, won the competition in 2007, 2009 and 2010. Loftus Versfeld also hosts the soccer side Mamelodi Sundowns. Pretoria also hosted matches during the 1995 Rugby World Cup. Loftus Versfeld was used for matches of soccer in the 2010 FIFA World Cup. There are three soccer teams in the city playing in South Africa's top flight football League, the Premier Soccer League. They are Mamelodi Sundowns and Supersport United. Supersport United were the 2008–09 PSL Champions. Following the 2011/2012 season the University of Pretoria F.C. gained promotion to the South African Premier Soccer League (PSL), the top domestic league. Cricket is also a popular game in the city. As there is no international cricket stadium in the city, it does not host any top-class cricket tournaments, although the nearby situated Centurion has Supersport Park which is an international cricket stadium and has hosted many important tournaments such as 2003 Cricket World Cup, 2007 ICC World Twenty20, 2009 IPL and 2009 ICC Champions Trophy. The most local franchise team to Pretoria is the Titans, although Northerns occasionally play in the city in South Africa's provincial competitions. Many Pretoria born cricketers have gone on to play for South Africa, including current captain AB de Villiers and T20 captain Faf du Plessis. The Pretoria Transnet Blind Cricket Club is situated in Pretoria and is currently the biggest Blind Cricket club in South Africa. Their field is at the Transnet Engineering campus on Lynette Street, home of differently disabled cricket. PTBCC has played many successful blind cricket matches with abled body team such as the South African Indoor Cricket Team and TuksCricket Junior Academy. Northerns Blind Cricket is the Provincial body that governs PTBCC and Filefelfia Secondary School. The Northern Blind Cricket team won the 40 over National Blind Cricket tournament that was held in Cape Town in April 2014. The Old Synagogue Building in Pretoria. It is now no longer used as a Synagogue but is now a Grade II Provincial Heritage Resource and protected under the National Heritage Resources Act (25 of 1999). The city is a major commercial centre and an important industrial centre. Its main industries are iron and steel works, copper casting, and the manufacture of automobiles, railway carriages and heavy machinery. Pretoria has a number of industrial areas, business districts and small home businesses. A number of chambers of commerce exist for Pretoria and its business community including Pretoriaweb, a business networking group that meets once a month to discuss the issues of doing business in Pretoria. The members of Pretoriaweb also discuss issues in various social media environments and on the website. The Pretoria civic arms, designed by Dr. Frans Engelenburg, were granted by the College of Arms on 7 February 1907. They were registered with the Transvaal Provincial Administration in March 1953 and at the Bureau of Heraldry in May 1968. The Bureau provided new artwork, in a more modern style, in 1989. The arms were : Gules, on an mimosa tree eradicated proper within an orle of eight bees volant, Or, an inescutcheon Or and thereon a Roman praetor seated proper. In layman's terms : a red shield displaying an uprooted mimosa tree surrounded by a border of eight golden bees, superimposed on the tree is a golden shield depicting a Roman praetor. The tree represented growth, the bees industry, and the praetor (judge) was an heraldic pun on the name. The crest was a three-towered golden castle; the supporters were an eland and a kudu; and the motto Praestantia praevaleat Pretoria. The coat of arms have gone out of favour after the City Council amalgamated with its surrounding councils to form the City of Tshwane Metropolitan Municipality. The Muckleneuk Campus of UNISA. The University of South Africa (commonly referred to as Unisa), founded in 1873 as the University of the Cape of Good Hope, is the largest university on the African continent and attracts a third of all higher education students in South Africa. It spent most of its early history as an examining agency for Oxford and Cambridge universities and as an incubator from which most other universities in South Africa are descended. In 1946 it was given a new role as a distance education university and in 2012 it had a student headcount of over 300 000 students, including African and international students in 130 countries worldwide, making it one of the world's mega universities. Unisa is a dedicated open distance education institution and offers both vocational and academic programmes. Old Arts Building (Ou Lettere Gebou) of the University of Pretoria. The University of Pretoria (commonly referred to as UP, Tuks, or Tukkies) is a multi campus public research university. The university was established in 1908 as the Pretoria campus of the Johannesburg based Transvaal University College and is the fourth South African institution in continuous operation to be awarded university status. Established in 1920, the University of Pretoria Faculty of Veterinary Science is the second oldest veterinary school in Africa and the only veterinary school in South Africa. In 1949 the university launched the first MBA programme outside of North America. Since 1997, the university has produced more research outputs every year than any other institution of higher learning in South Africa, as measured by the Department of Education's accreditation benchmark. The Tshwane University of Technology (commonly referred to as TUT) is a higher education institution, offering vocational oriented diplomas and degrees, and came into being through a merger of Technikon Northern Gauteng, Technikon North-West and Technikon Pretoria. TUT caters for approximately 60,000 students and it has become the largest residential higher education institution in South Africa. This complex is the headquarters to the South African Air Force. The S.A.M.S Military Health Department. Magazine Hill which is the regimental Headquarters to the Pretoria Regiment, A reserve tank regiment of the South African Army. Joint Support Base Garrison that is responsible for the town management of Thaba Tshwane. The Tshwane Regiment, A reserve motorised infantry regiment of the South African Army. The 18 Light Regiment, A reserve artillery regiment of the South African Army. The National Ceremonial Guard and Band. The Wonderboom Military Base is located adjacent to the Wonderboom Airport and is the headquarters of the South African Army Signals Formation. It also houses the School of Signals, 1 Signal Regiment, 2 Signal Regiment, 3 Electronic Workshop, 4 Signal Regiment and 5 Signal Regiment. The South African Air Force College, the South African Military Health Service School for Military Health Training and the South African Army College are situated in the Thaba Tshwane Military Base and are used to train Commissioned and Non-commissioned Officers to perform effectively in combat/command roles in the various branches of the South African National Defence Force. The South African Defence Intelligence College is also located in the Sterrewag Suburb north of Air Force Base Waterkloof. While technically not within the city limits of Pretoria, Air Force Base Swartkop and Air Force Base Waterkloof are often used for defence related matters within the city. These may include aerial military transport duties within the city, aerospace monitoring and defence as well as VIP transport to and from the city. 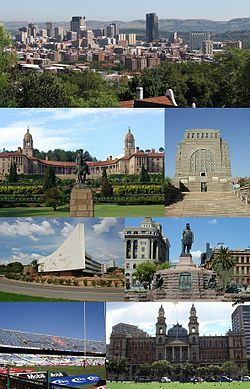 On 26 May 2005 the South African Geographical Names Council (SAGNC), which is linked to the Directorate of Heritage in the Department of Arts and Culture, approved changing the name of Pretoria to Tshwane, which is already the name of the Metropolitan Municipality in which Pretoria, and a number of surrounding towns are located. Although the name change was approved by the SAGNC, it has not yet been approved by the Minister of Arts and Culture. The matter is currently under consideration while he has requested further research on the matter. Should the Minister approve the name change, the name will be published in the Government Gazette, giving the public opportunity to comment on the matter. The Minister can then refer that public response back to the SAGNC, before presenting his recommendation before parliament, who will vote on the change. Various public interest groups have warned that the name change will be challenged in court, should the minister approve the renaming. The long process involved made it unlikely the name would change anytime soon, if ever, even assuming the Minister had approved the change in early 2006. The Tshwane Metro Council has advertised Tshwane as "Africa's leading capital city" since the name change was approved by the SAGNC in 2005. This has led to further controversy, however, as the name of the city had not yet been changed officially, and the council was, at best, acting prematurely. Following a complaint lodged with the Advertising Standards Authority (ASA), it was ruled that such advertisements are deliberately misleading and should be withdrawn from all media. Despite the rulings of the ASA, Tshwane Metro Council failed to discontinue their "City of Tshwane" advertisements. As a result, the ASA requested that Tshwane Metro pay for advertisements in which it admits that it has misled the public. Refusing to abide by the ASA's request, the Metro Council was banned consequently from placing any advertisements in the South African media that refer to Tshwane as the capital. ASA may still place additional sanctions on the Metro Council that would prevent it from placing any advertisements in the South African media, including council notices and employment vacancies. After the ruling, the Metro Council continued to place Tshwane advertisements, but placed them on council-owned advertising boards and busstops throughout the municipal area. In August 2007, an internal memo was leaked to the media in which the Tshwane mayor sought advice from the premier of Gauteng on whether the municipality could be called the "City of Tshwane" instead of just "Tshwane". This could increase confusion about the distinction between the city of Pretoria and the municipality of Tshwane. In early 2010 it was again rumoured that the South African government would make a decision regarding the name, however, a media briefing regarding name changes, where it may have been discussed, was cancelled shortly before taking place. Rumours of the name change provoked outrage from Afrikaner civil rights and political groups. It later emerged that the registration of the municipality as a geographic place had been published in the government gazette as it had been too late to withdraw the name from the publication, but it was announced that the name had been withdrawn, pending "further work" by officials. The following week, the registration of "Tshwane" was officially withdrawn in the Government Gazette. The retraction had reportedly been ordered at the behest of the Deputy President of South Africa Kgalema Motlanthe, acting on behalf of President Jacob Zuma, as minister of Arts and Culture Lulu Xingwana had acted contrary to the position of the ANC, which is that Pretoria and the municipality are separate entities, which was subsequently articulated by ANC secretary general Gwede Mantashe. 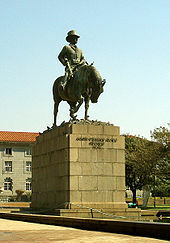 In March 2010, the "Tshwane Royal House Committee", claiming to be descendants of Chief Tshwane, called for the name to be changed, and for the descendants of Chief Tshwane to be recognised, and to be made part of the administration of the municipality. According to comments made by Mayor Kgosientso Ramokgopa in late 2011, the change would occur in 2012. However, there remained considerable uncertainty about the issue. As of 2018[update], the proposed name change has not occurred and now seems unlikely to happen. Pretoria National Botanical Garden, a botanical garden containing a massive collection of native flora. The National Zoological Gardens of South Africa, the premier zoological gardens of South Africa. Church Square, the historical governamental centre of the South African Republic. Union Buildings, the executive branch of the South African government. Mahlamba Ndlopfu, the official residence of the President of South Africa. Marabastad, a historical shopping district for non-whites during Apartheid. Voortrekker Monument, a historical complex dedicated to the Great Trek. Hatfield Square, the main student relaxation district. Pretoria railway station, a historical landmark and departure point for metrorail and Gautrain trains. Freedom Park, a historical complex dedicated to the end of Apartheid and the fallen soldiers of South Africa after 1994. Pretoria Forts, historical bastions designed to protect the city against the British, including a museum on the Boer Wars. State Theatre, South Africa, the premier national performing arts complex. Mahlamba Ndlopfu, the Presidential residence in Pretoria. ^ a b c d e "Main Place Pretoria". Census 2011. ^ "Gauteng's Human Development Index" (PDF). Gauteng City-Region Observatory. 2013. p. 1. Archived from the original (PDF) on 11 January 2015. Retrieved 1 January 2015. ^ a b "Global city GDP 2011". Brookings Institution. Archived from the original on 4 June 2013. Retrieved 18 November 2014. ^ a b "Pretoria | national administrative capital, South Africa". Encyclopedia Britannica. Retrieved 18 July 2018. ^ Raper, Peter E. (1987). Dictionary of Southern African Place Names. Internet Archive. p. 373. Retrieved 28 August 2013. 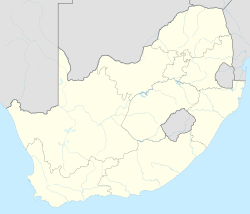 ^ "South Africa's provinces: Gauteng". Archived from the original on 22 June 2011. Retrieved 14 June 2011. ^ Tools, Free Map. "Elevation Finder". ^ Population, according to the 2001 Census, of the Pretoria "main place". ^ Population, according to the 2007 Community Survey Archived 25 August 2013 at the Wayback Machine, of the City of Tshwane Metropolitan Municipality after the 2011 annexation of the Metsweding District Municipality. ^ tinashe (1 June 2012). "Transfer of the Indian community of Pretoria to Laudium ordered". ^ "South African Reserve Bank Building, Pretoria | Building 103551". Pretoria /: Emporis. Retrieved 19 April 2014. ^ "National Botanical Gardens". SA-Venues. Retrieved 12 September 2008. ^ "Rovos Rail website". Rovos.co.za. Retrieved 3 July 2010. ^ "Capital Park". Rovos Rail. Archived from the original on 9 September 2008. Retrieved 12 September 2008. ^ "New Departure Point – Important note!". Friends of the Rail. Retrieved 12 September 2008. ^ "Tshwane Bus Booklet". Archived from the original on 28 May 2010. ^ ": Ditsong Museums Of South Africa". Ditsong.org.za. Archived from the original on 28 May 2014. Retrieved 19 April 2014. ^ "Traditional & Folk Songs with Chords: Marching To Pretoria". Traditionalmusic.co.uk. Retrieved 19 April 2014. ^ ""'I Am the Walrus' Lyrics," Shmoop: We Speak Student". Shmoop.com. Retrieved 19 April 2014. ^ a b "Pretoria Art Museum - Pretoria Attractions - Gauteng Conference Centre Midrand". ^ "Madiba's Journey – South African Tourism". ^ "World's largest statue of Mandela unveiled". 17 December 2013. ^ Premier Soccer League (13 May 2012). "Tuks secure Premiership promotion - SuperSport - Football". SuperSport. Retrieved 16 November 2012. ^ "AmaTuks make it to top flight". Sowetan LIVE. 10 May 2012. Retrieved 16 November 2012. ^ "ABLEWIKI:Old Synagogue (Paul Kruger Street)". WikiUP. Archived from the original on 15 April 2014. Retrieved 19 April 2014. ^ "Synagogues in Pretoria - Shuls in Pretoria - Jewish Temples in Pretoria". Maven.co.il. Retrieved 19 April 2014. ^ Bodel, J.D. ; 'The Coat of Arms and Other Heraldic Symbols of the City of Pretoria' in Pretoriana (November 1989). ^ Transvaal Official Gazette 2372 (11 March 1953). ^ 'Nuwe Standswapen' in Toria (July 1989). ^ "SA Universities Retrieved 21 January 2011". Universityworldnews.com. Retrieved 12 January 2012. ^ "About Veterinary Science > University of Pretoria". Web.up.ac.za. 25 August 2010. Archived from the original on 17 January 2012. Retrieved 12 January 2012. ^ "Wits Business School". MBA.co.za. Archived from the original on 9 August 2007. Retrieved 12 January 2012. ^ "Retrieved 20 March 2010". Mba.co.za. Archived from the original on 9 August 2007. Retrieved 12 January 2012. ^ "UP in a Nutshell 2008" (PDF). Archived from the original (PDF) on 19 February 2012. Retrieved 12 January 2012. ^ "Profile of the". CSIR. Archived from the original on 24 July 2012. Retrieved 16 November 2012. ^ a b c d e "contact us". Army.mil.za. 13 December 2010. Retrieved 19 April 2014. ^ a b Col (Ret) Lionel Crook. "South African Gunner" (PDF). rfdiv.mil.za. Archived from the original (PDF) on 13 June 2013. Retrieved 9 February 2014. ^ "Pretoria Regiment". Saarmourassociation.co.za. Archived from the original on 2 March 2014. Retrieved 19 April 2014. ^ "SA Army Signal Formation". Army.mil.za. 19 August 2013. Retrieved 19 April 2014. ^ "The South African Air Force". Saairforce.co.za. Retrieved 19 April 2014. ^ "Pretoria name change is approved". BBC News. 27 May 2005. Retrieved 3 July 2010. ^ "SABC pulls 'Tshwane city' ads". News24.com. 11 April 2007. Archived from the original on 9 March 2009. Retrieved 3 July 2010. ^ Independent Online. "SA capital advert row sparks ad-alert threat, IOL". Iol.co.za. Retrieved 3 July 2010. ^ "Down with Pretoria signs! : South Africa: Politics". News24. 2 August 2007. Archived from the original on 9 March 2009. Retrieved 3 July 2010. ^ Wilson Johwa. "Mashatile postpones name changes after 'technicality'". Businessday.co.za. Retrieved 3 July 2010. ^ "AfriForum to fight for Pretoria name". Timeslive.co.za. Archived from the original on 3 February 2010. Retrieved 3 July 2010. ^ Independent Online. "Pretoria name change rethink". Iol.co.za. Retrieved 3 July 2010. ^ "Pretoria/Tshwane delayed". Jacarandafm.com. 2 February 2010. Retrieved 3 July 2010. ^ "Xingwana retracts Pretoria name change". Politicsweb.co.za. Retrieved 3 July 2010. ^ "It's officially Pretoria. iafrica.com". News.iafrica.com. Archived from the original on 9 February 2010. Retrieved 3 July 2010. ^ "Pretoria is Pretoria again – for now". Jacarandafm.com. Retrieved 3 July 2010. ^ "Government policy.'Leadership'". Leadershiponline.co.za. 23 March 2010. Archived from the original on 11 June 2010. Retrieved 3 July 2010. ^ "Tshwane Royals: 'Change Pretoria for benefit of all'". Timeslive.co.za. Archived from the original on 17 March 2010. Retrieved 3 July 2010. ^ Location Settings (22 November 2011). "Pretoria will become Tshwane - mayor". News24. Retrieved 16 November 2012. ^ "Old cities, new names | Radio Netherlands Worldwide". Rnw.nl. Archived from the original on 18 January 2012. Retrieved 16 November 2012. ^ "Pretoria of Tshwane? Minister weet self nie". Beeld. 27 January 2012. Archived from the original on 31 January 2012. Retrieved 16 November 2012. Wikisource has the text of the 1922 Encyclopædia Britannica article Pretoria. Wikivoyage has a travel guide for Pretoria. Wikimedia Commons has media related to Pretoria. This page was last edited on 11 April 2019, at 01:09 (UTC).